Bill Atkinson, Within the Stone, Browntrout Pub, 2004. 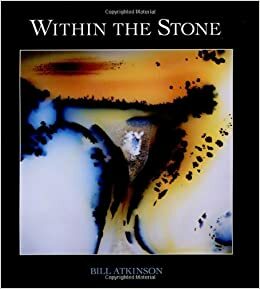 With this book of color photographs of the polished hearts of stones portrayed as natural paintings, BILL ATKINSON completes his transition from whiz kid of Silicon Valley to high priest of Silica. After helping to usher in the age of personal computing by designing the graphical user interface of the Macintosh computer, Atkinson turned his visual and technical talents to nature photography. While shooting in the Painted Desert, Atkinson became intrigued with the brilliant colors in the petrified wood littering the ground. He brought home some polished rock slabs, photographed them in natural color and without magnification, and was enthralled. The photographs looked more like paintings of forgotten dreams than either rocks or photographs. Atkinson went on to borrow and photograph thousands of art-quality stones at gem shows. From these thousands of stones, Atkinson has picked for WITHIN THE STONE those seventy-two that yielded the most striking, the most poetic, and the most ineffable images. Many of the photographs suggest the styles of particular masters of modern painting: Klee, Klimt, Turner, OKeefe. To accompany these images, the publisher commissioned seventy literary pieces for WITHIN THE STONE from seven top writers, each one accomplished in both scientific and artistic fields. Each writer was asked to free-associate with his or her ten assigned photographs as though they were Rorschach patterns on steroids. The seven contributors are DIANE ACKERMAN (poet and psychologist), PHILIP BALL (Nature editor and dramatist), JOHN HORGAN (science writer and philosopher), ANDREW REVKIN (New York Times reporter and screenplay writer), DORION SAGAN (science writer and novelist), TYLER VOLK (biologist and architect), and DAVID ZINDELL (science fiction novelist and mathematician). In an appendix to WITHIN THE STONE, professional lapidaries SI and ANN FRAZIER and mineral scientist ROBERT HUTCHINSON provide a detailed description and commentary for each specimen.